Happy Mother’s Day to all those fabulous Mamas out there, most of all….mine! For those of you regular readers of Shut Up & Cook, you know that Marnie…aka Marnie Poppins is a regular addition in the kitchen, be it here in Seattle or back in my childhood home of Ipswich, Massachusetts. Easy, Elegant, and Delicious…this Chicken Pan Sauce is guaranteed to impress. In addition to all those Mom Skills she has (such as the ability to actually fold fitted sheets) she is an exquisite cook, pulling together delicious meals with seeming effortlessness, all the while offering sage life advice. 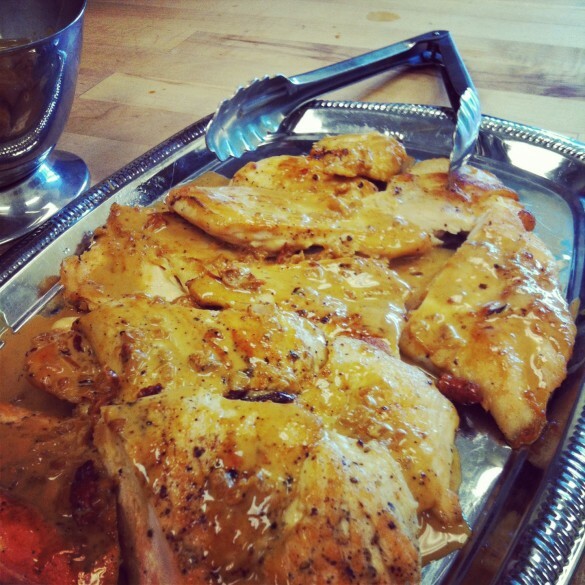 While this Chicken Pan Sauce with White Wine and Shallots was actually another dish from my Culinary Camp in Boulder with my Dad, it would be a perfect dinner for Mother’s Day (or any night this week) since it’s truly Easy, Elegant, and Delicious..just the way I like it. My sweet mama…in the kitchen, bien sur. Remove chicken from pan and cover with foil while resting. Add shallots and sweat over low heat until fragrant and translucent, about 4-6 minutes. Add the artichoke hearts and cook another 2-3 minutes. Deglaze the pan with the wine and reduce to 1/4 cup. Add the stock and reduce to 1/2 cup. Add cream and reduce to nappe consistency (aka a consistency thick enough to coat the back of a spoon). There should be about one cup of sauce. Slice the chicken against the grain on the bias. Serve chicken over angel hair pasta, finished with spoonful of sauce and garnished with chopped parsley. 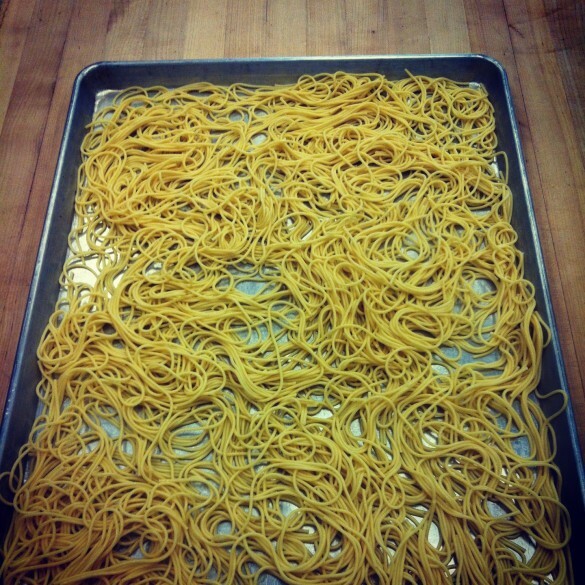 Brilliant party prep trick: The day before cook the pasta until one minute before al dente. Drain, rinse, and toss with oil. Hold on a cookie sheet in the fridge, covered with plastic wrap. To use, simply finish cooking for one minute in a pot of boiling water. The chicken looks mouthwatering with the pan sauce. Your mama looks so pretty and elegant. She has such a warming and sweet smile. I couldn’t agree more, Angie! She’s a keeper! Easy and full of flavor. Your mom is adorable! Great looking dish! The flavors look wonderful. And I agree with Angie and Alyssa – your mom has a great smile, and is adorable! Good post – thanks. Thanks John! I love these easy, yet delicious weeknight dinners. What’s your favorite weeknight meal to make when you want something a little elegant? Great post. The chicken dish looks scrumptious. Thanks so much! I’ll definitely be making this one again. Wow, you and your Dad ate and cooked well at Culinary Camp! Love the sound of this chicken. And I love seeing your Mom even more! She looks incredibly kind and warm (like you!). There is no way that is your mom…your older sister, but definitely NOT your mom! Love your blog! Sheri…you are the sweetest! In fact, I just forwarded your comment along to my Mama as it’s going to make her day too! Thanks so much for stopping by. Come back soon…lots of recipes to come!